Taylor Sheridan’s “Wind River” takes its title from the American Indian reservation in Wyoming where the frozen body of a young Native American woman, Natalie Hanson (Kelsey Chow), is discovered by Cory Lambert (Jeremy Renner), a U.S. Fish and Wildlife Service agent. And if the film’s concluding title card, citing the epidemic of Native American women who go missing and remain missing, would suggest a film that unravels this woman’s identity, allowing her to be reclaimed as the person she was, that never really happens. In fact, “Wind River” reveals who she is almost immediately, and then spends little time on who she was, more often concerned with mood and employing it to bring home a point that, frankly, never quite connects with what that aforementioned title card evokes, muddling “Wind River’s” meaning. The mood is cast by the danger of the place, where a blizzard can whip up seemingly within minutes, where going outdoors free of heavy winter clothing puts your life in peril within seconds, where a life led, we are told more than once, correlates directly to survival. Sheridan portrays that survival in both dramatic and comic terms, the latter seen when Jane Banner (Elizabeth Olsen), a Floridian FBI agent stationed in Las Vegas who is summoned in the wake of the frozen body, arrives without nary a hint of winter weather gear only to learn the body is five miles away in the snowy wilderness. She’s out of her element, yes, but not in over her head, which is a crucial delineation and one that Olsen successfully plays to. She is a fish out of water, but Olsen still comports herself in the manner of someone familiar with hacking through red tape, whether in the sun & warmth or in the ice & snow, and therefore sizing up a situation and acting accordingly, which is why Jane is willing to ask Cory for help. As such, Cory never really looks at Jane with the same sort of derision or suspicion as Ben (Graham Green), the tribal cop, or the father (Gil Birmingham) of Natalie. After all, Cory is a white man in Native America, which is explicated more often than it really needs to be in the dialogue itself, accepted if occasionally chastised, but nevertheless a person who has learned how to exist in a world regulated apart from typical bureaucracy. This is especially evoked in the movie’s big set piece, a massive stand-off, with nearly a dozen characters standing in the snow with guns aimed in all different directions, everyone hollering about who and who does not have authority as Jane steps to the forefront and says that because she is FBI and where they are is federal land she has authority. I will not say how all this ends but, rest assured she doesn’t have authority, not like she thinks, brought home in the subsequent scene where an eerily calm Cory essentially defers all authority to the land. 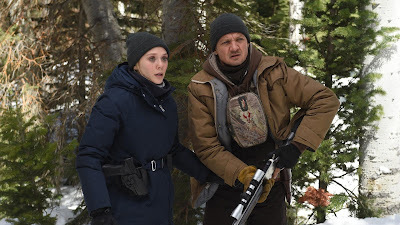 The latter scene also allows for a modicum of vengeance, which is more or less what this murder investigation becomes about, which is where “Wind River” goes wrong. Cory is given backstory in the form of a young daughter who died for reasons not to be disclosed. This means his attempts to help solve Natalie’s murder becomes something of an attempt for emblematic healing, which is dispiriting, not because Renner plays these moments poorly but because it cheapens Natalie’s death by turning it into something else, and by leaving Natalie as an enigma. All we get to know of her is how Sheridan solves the murder mystery, an ungainly inserted flashback wherein she is still sort of just beside the point, not exactly collateral damage but not far from it, first becoming the means of one man to defend his honor and then a rag doll to the gruesome misdeeds of other men. And if everyone here is supposed to defer to the whims of the land, well, every character in a movie defers to his/her maker, and Sheridan sadly leaves Natalie hung out to dry.